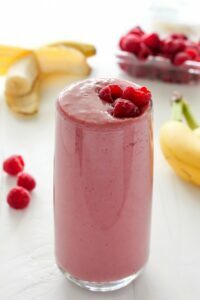 This deliciously refreshing Raspberry Banana Smoothie is made with simple ingredients and takes just minutes to prepare! Perfect for busy mornings or afternoons. Are you a smoothie fan? Me…? Ooooooh heck yesss. And lately I’ve been sipping one down every-single-morning after yoga. Fresh, fruity, and fast – what’s not to love? 1) The ingredients are simple and fresh. 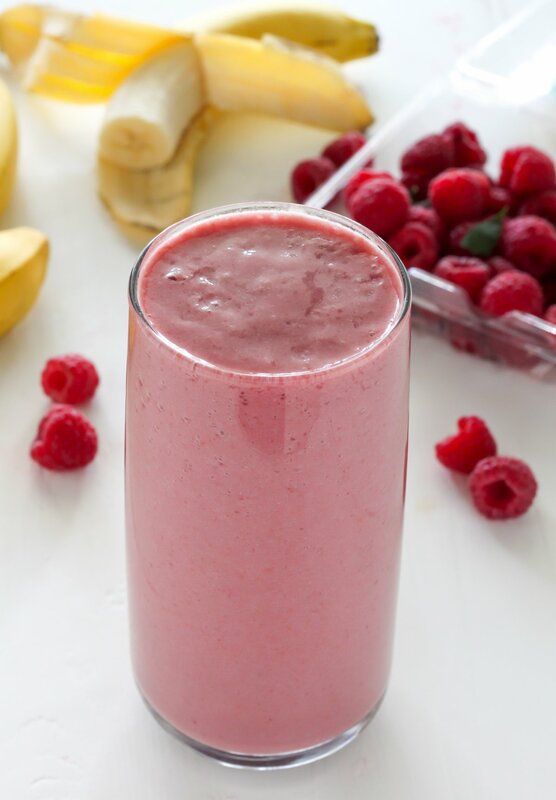 All you need to make this smoothie dream a reality is a banana, some frozen raspberries, a splash of orange juice, Silk Almond Milk, and honey. I bet you have some of these ingredients – if not all of them – already in your kitchen! 2) This recipe is FAST! I’m talking 3 minutes all together fast. Gotta love that! 3) Delicious, creamy, and so flavorful! Now, a few quick notes on the ingredients! For the liquid in this smoothie I chose to use almond milk. 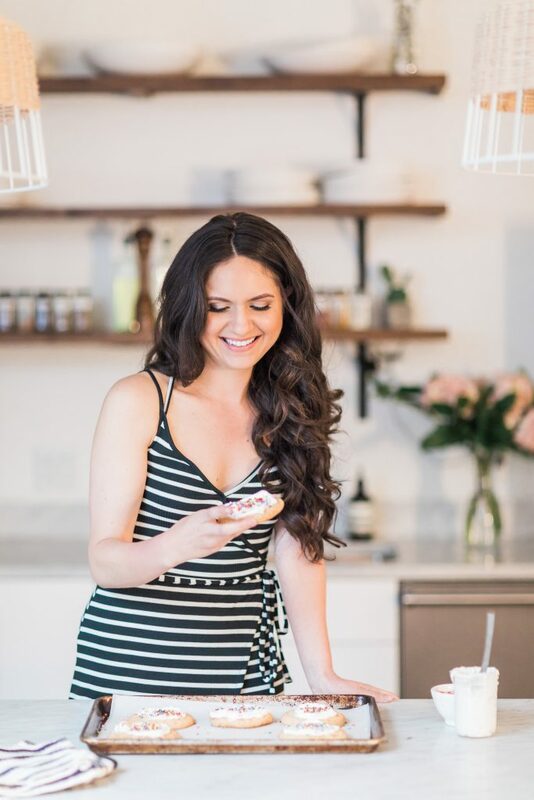 I love using Silk Almond Milk in all of my smoothies as it’s lower in calories than dairy based products and gives a much smoother consistency to smoothies than using water or ice. *If you’re vegan and would like to try this smoothie, feel free to leave out the honey and use maple syrup or agave in its place. *I highly recommend using frozen raspberries and bananas for the creamiest texture. If you don’t want to buy them frozen from the store, simply pop freshly sliced bananas and berries in the freezer until solid. 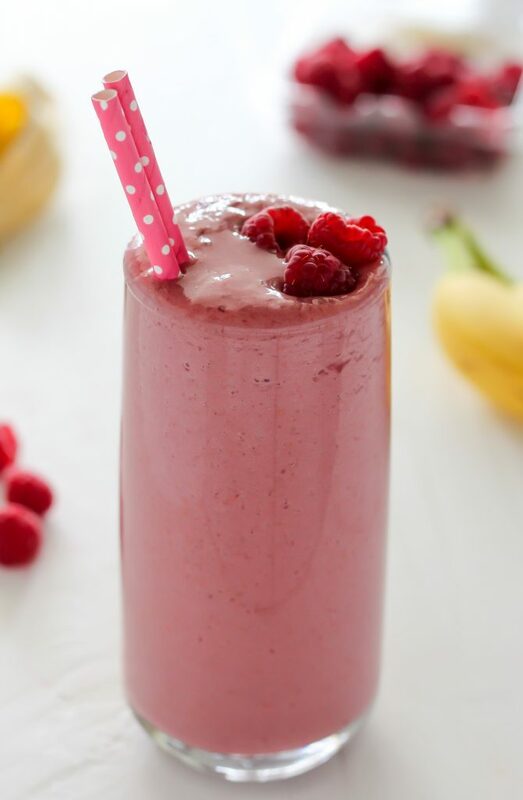 Thick and Creamy Raspberry Banana Smoothie! 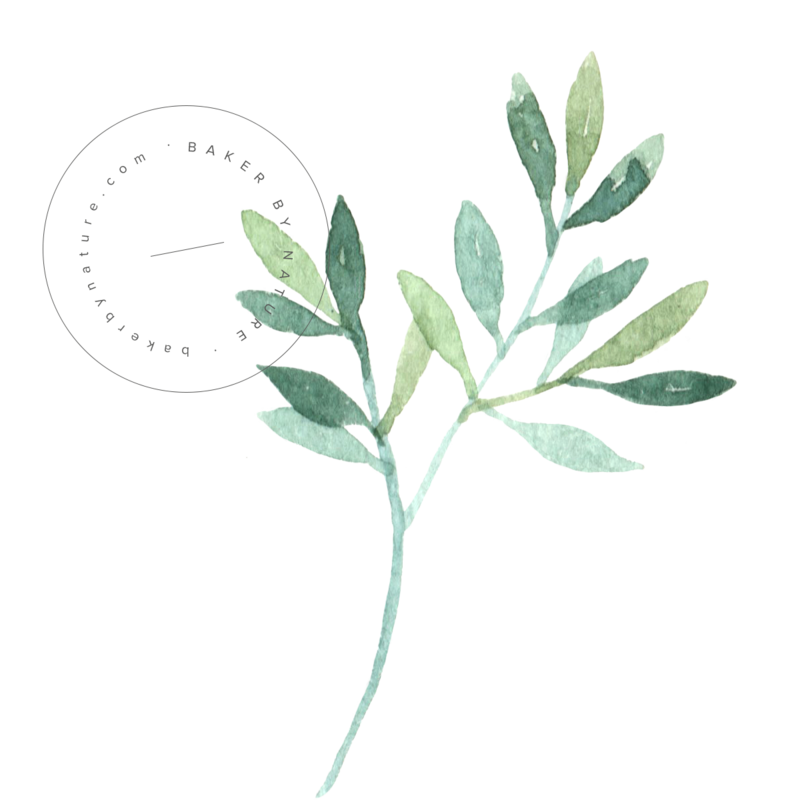 Place all of the ingredients in a blender and pulse until smooth, about 30 seconds. Serve right away! I only tried banana and strawberries 🙂 Would love to try banana and raspberries. For sure will try this! I am a smoothie addict! Can’t get enough. Love how simple this one is. And the color – of course I’m totally crushing on the color! Hope you’re having a great weekend! 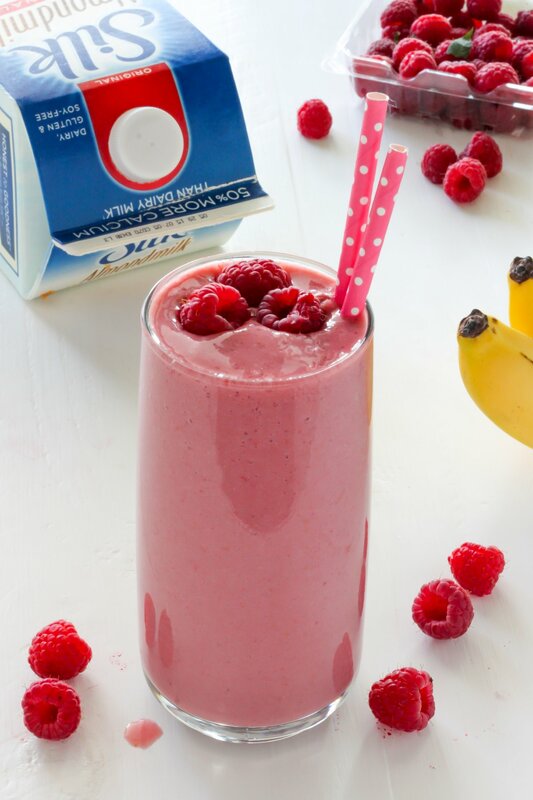 What a simple yet flavorful milkshake! I would like a trough-full please. 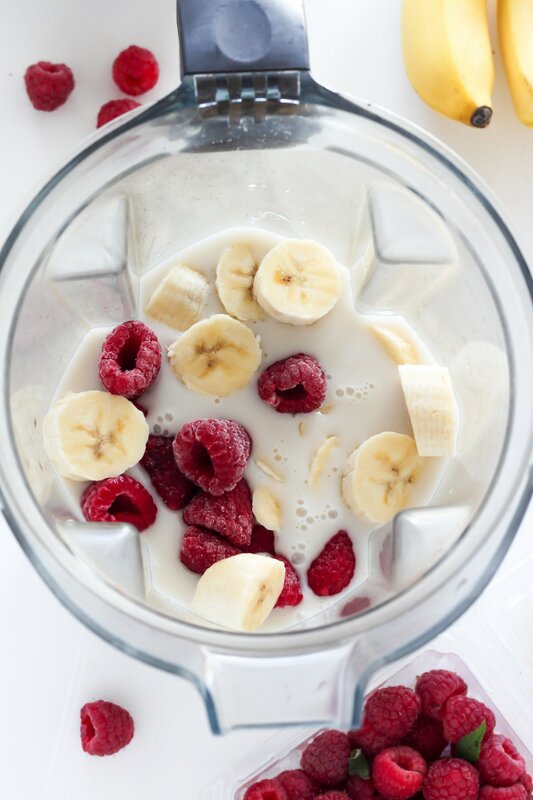 I love quick smoothies! I need to ditch the strawberries for a bit & try this out with raspberries – yum! WOW! Looks yummy. I am a huge fan of smoothies. The combination of raspberry and banana go very well together. I’d love to try this and hope it tastes same as it looks. Keep sharing such blogs. Can someone tell me what this smoothie do for you? How many time can we drink this? Is this recipe for one serving? 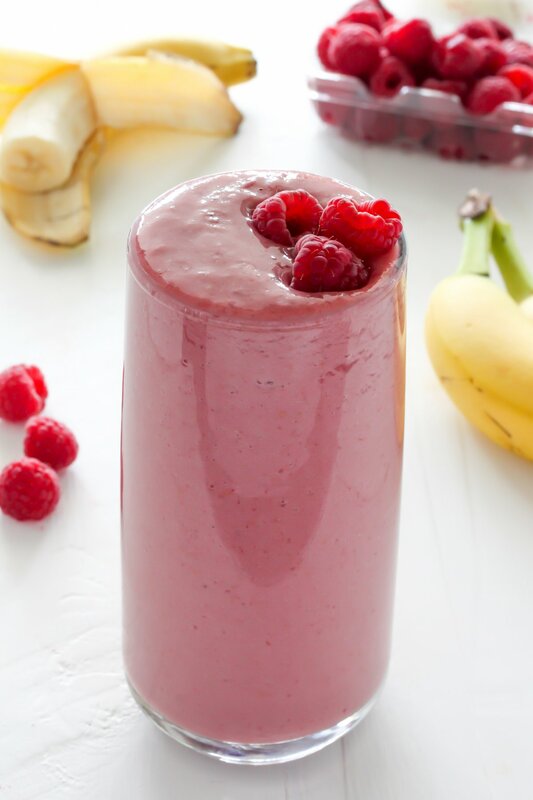 I love any berry smoothie and usually just add leafy green and raw oats. Can I do this without OJ? Should I substitute it for something? Hi Abbey. You could just use more milk, but it will be a little less fruity tasting. How many servings is this smoothie? 3 bananas seems like a lot for one serving. That’s all I have too! Will have to use Strawberries or blueberries! Not sure yet. Wow! That looks so delicious!Actually, I pinned it on Pinterest. I’ll definitely give a 5 star for this one. Thank you for sharing your recipe with us. Hi! I am allergic to orange juice, what could I use instead? How many calories does it have and how much can you drink ? Loved it. I use 2 c. frozen mixed berries (blueberries, blackberries, strawberries ,raspberries), handful of fresh spinach, 1 frozen banana, 1 c. almond milk, 1 scoop organic protein vanilla bean powder, 1 T. flax seed, in a blender until smooth. Delicious! Is it healthy? Yes! That’s a great choice of smoothie and I think I might try that soon!